America’s War in Vietnam remains a signpost signifying a moment when America’s own exceptionalist myth of invincibility began to falter in open sight. The watershed moment of the last helicopter leaving Saigon in 1975 became emblematic of a lumbering, highly equipped by deeply demoralised American armed forces that ultimately could not win a war against revolutionary fighters defending their home soil against the second foreign force they had to contend with in a matter of decades. The lessons that a declining French imperial-republic learned in 1954 were learned by the United States in 1975 in spite of the fact that by then, France was reduced to a medium sized western European power while the US remained a superpower. The US War in Vietnam saw 3,403,000 men deployed to the region while over 58,000 perished. The amount of lives lost, and both years and money spent in Vietnam led to a gradual rethinking in US military strategy throughout the developing world. After Afghanistan’s Saur Revolution in 1978, US National Security Adviser and anti-Soviet hawk Zbigniew Brzezinski argued for a military approach to the events unfolding in Afghanistan which saw a Soviet allied government in Kabul fight rebel forces in what would grow into a long civil war whose effects are felt in the region to this day. But rather than deploy thousands of American enlistees let alone conscripts to Afghanistan, the US instead decided to arm and fund Mujaheddin jihadists as proxies. This meant that while the US contributed arms and money to the Mujaheddin – fewer Americans in the 1980s knew what the Mujaheddin of Afghanistan actually was, while almost all Americans in the 1960s and 1970s knew what the Viet Cong was for the simple reason that Viet Cong fighters killed Americans while no ordinary US soldiers were in Afghanistan during the 1980s. In 1982 Ronald Reagan’s deployed of a small contingent of US Marines to Beirut during the most heated phase of the Lebanese Civil War. The following year, a crude set of truck bombs which killed 241 Americans and 58 French troops was enough to motivate Reagan to fully withdraw from Lebanon. On the tip of many American tongues at the time was “we must avoid another Vietnam”. With the rise of the neocons on the American right in the 1990s, many of whom infamously dodged the draft during the War in Vietnam, a new method of thinking developed that was a hybrid of the large scale traditional Vietnam style war and the 1980s Ronald Reagan style of warfare which tended to involve minimal if any troop deployment and an increased reliance on air power. Reagan’s strategy was perhaps best exemplified by the Operation El Dorado Canyon bombing campaign against Libya in 1986 which lasted just a single day. The neocon hybrid strategy which continues to play out in Afghanistan in spite of Donald Trump’s apparent dislike for the neocon faction can be described as follows: Use traditional air-power and other technologies (including drones) as much as possible while maintaining a manned presence that never gets to large to result in Vietnam levels of casualties. In this sense, while the US is “losing” in Afghanistan based on traditional indicators of what a victory might look like – in actual fact, according to the present strategy in Afghanistan, the US is actually “winning”. In spite of the fact that the Taliban now control upwards of 50% of Afghan territory while no ceasefires have yet to hold in a meaningful way, the US is fully aware that an Afghan insurgency is ultimately as difficult to defeat in the 21st century as the Viet Cong and North Vietnamese were in the 20th century. To understand why something that looks like “losing” is actually “winning” in the eyes of contemporaneity US policy makers in Afghanistan, one must understand that at present the US is not so much trying to win a traditional war as it is trying to make sure that no other nation is able to reap the benefits of a stable, peaceful and united Afghanistan. Disrupt and/or retard the burgeoning pan-Asian partnership in south Asia involving China, Russia, Pakistan and Iran. In this sense, the US war on Afghanistan is in the words of Orwell “not meant to be won but to be endless”. So long as the US can minimise its own loses, the public will remain unaffected by the apparent quagmire in Afghanistan which is at this point a quagmire by design with the ultimate goal of creating a long-term regional problem for all of Afghanistan’s neighbours as well as Russia. I am please to announce that sister Zara Ali Joined UP. BEIRUT, LEBANON (7:10 P.M.) – The Houthi forces announced on Monday evening that their rocket battalion struck the Dubai International Airport. BEIRUT, LEBANON (10:10 P.M.) – The United Arab Emirates announced on Monday evening that there were no disruptions at the Dubai International Airport today. According to the UAE General Civil Aviation Authority, the air traffic movement was normal, adding that the Houthi claims regarding the bombing of the Dubai International Airport were false. “The UAE General Civil Aviation Authority: Air traffic movement in the UAE is normal with no disruptions; Houthi media claims regarding Dubai International Airport are untrue,” they said. Earlier today, the Houthi forces alleged that they launched a drone attack Dubai International Airport however, no video footage was released to corroborate the claims. John Gunther Dean, now 92, and a former American ambassador to five countries, has long maintained that Israel was behind his attempted assassination on August 28, 1980, in a suburb of Beirut, which was attributed to a rightwing Lebanese group. Dean and his wife and daughter and son-in-law were in a motorcade and narrowly escaped serious injury. Dean said that he was targeted because he was doing something regarded as antithetical to Israel’s interest: consulting with the Palestine Liberation Organization and its head, Yasser Arafat, at a time when such contacts were the third rail in US politics. He was also outspokenly critical of Israeli attacks on Lebanon. A new book offers backing to Dean’s claim. But while that book has been highly-publicized, the question of whether Israel attacked our ambassador has gotten no attention in the press. That is not a surprise; for Dean has asserted that the case itself was never thoroughly investigated by the U.S. government. “On August 28, 1980, the three-car motorcade of John Gunther Dean, the American Ambassador to Lebanon, was attacked on the motorway by several assailants armed with automatic rifles as well as light anti-tank weapons or LAWs. The ambassador and his wife escaped unscathed. “Over the years Ambassador Dean has repeatedly argued that Israel was behind the August 1980 attempt on his life. In an interview for the Oral History Project in September 2000, he explained how the Lebanese Intelligence services had managed to retrieve the empty canisters of two of the light anti-tank weapons (LAWs) that had been used during the attack on his motorcade and, during raiding a house by the intersection where the assault had taken place, found 8 more. Dean collected the numbers on the 10 missiles & sent them to Washington to be traced. “All of this has been known for years, although it is very rarely discussed in the US media. When discussed, Dean’s assertions/accusations are dismissed as conspiracy theories. “In January however, a book was published that appears to reinforce the plausibility of Dean’s position. The book is Ronen Bergman’s Rise and Kill First. It has received rave reviews in the US press, and its author has been interviewed countless times since the book was published. The book focuses on Israeli ‘targeted assassinations’ and it contains one truly remarkable revelation. “In 1979, [Rafael] Eitan and [Meir] Dagan [both brass in the Israel Defense Forces] created the Front for the Liberation of Lebanon from Foreigners, and ran that fictitious group from 1979 to 1983. In 1981 and 1982, Ariel Sharon used that Front to conduct a series of indiscriminate car bombings that killed hundreds of civilians. “The objective of this massive ‘terrorist’ car bombing campaign was to ‘sow chaos’ amongst the Palestinian & Lebanese civilian population” and, in 1981-82, to provoke the PLO into resorting to ‘terrorism,’ thus providing Israel with an excuse to invade Lebanon. “The FLLF operation is described in great details in Bergman’s book. His account is based solely on first hand accounts from Israeli officials involved in the operation or who were aware of it at the time. It is also described in detail in my article here [in Mondoweiss in May: The remarkable disappearing act of Israel’s car-bombing campaign in Lebanon or: What we (do not) talk about when we talk about ‘terrorism’]. “As I show in this article, not a SINGLE review of Bergman’s book in the US media has mentioned the FLLF operation. Nor has it been mentioned in a SINGLE of the countless interviews he has given on the topic over the last few months. The US media has thus been fully silent about the fact that Israeli officials directed a major & fully indiscriminate car bombing campaign that killed 100s of civilians in Lebanon. This silence also means that the US media has failed to notice the possible implications of this revelation about the Dean case. “Bergman himself does not mention the assassination attempt against Dean. But we know that the FLLF took credit for this attack at the time. That Dean’s own investigation pointed to Israel & to its Lebanese proxies. And we now know that the FLLF was CREATED and RUN by Israel. Bergman does note on several occasions in his book that he is not allowed to write and talk about a lot of the operations that his sources talked to him about. I wonder if this FLLF operation vs Dean is one of those. Let us add some details and context. Dean was born to a Jewish family in Germany in 1926 and escaped the Holocaust to the United States in 1938, later graduating from a Kansas City high school. It goes without saying that being ambassador to five countries, Cambodia, Denmark, Lebanon, Thailand and India, is a stellar career in foreign service. I reached out to Dean and did not hear from him, but in his oral history, the ambassador says that the attack was a “horrible experience” that scarred his daughter. The road at that stretch was wide and a Mercedes car was parked below a small hill overlooking the road. As we turned, our convoy took 21 rifle bullets and two grenades anti-tank fired against the car I was in. My wife threw herself on top of me and said: “Get your head down” because I was trying to look out and was stunned by the “fireworks”. When you have these light anti-tank weapons (LAWs) explode, there are a lot of sparks and explosions. The two LAWs fired at my car bounced off the rear of the car. I also noticed that on the window of my armored car there were some shots all very well centered where I was sitting, but they had not penetrated because the plastic windows were bullet-proof. Dean says he was clearly understood to be an enemy of Israel because on repeated occasions he had publicly condemned Israel’s attacks on Lebanon’s borders and air space, a stance the State Department usually did not take. Scurrilous attacks on me in the Israeli Knesset and the Israeli press just prior to the assassination attempt indicate that the Israeli authorities were unhappy with the activist role I played in Lebanon, defending Lebanese sovereignty and maintaining an active relationship with the PLO–the very policies I was given to pursue by the president of the United States. The venomous talk in the Israeli Knesset by the right-wing parties portrayed me as a tool of the Palestinians. Because I was willing, even eager, to talk with all the factions in Lebanon’s civil war, I was suspected of being anti-Israel. At that time, the PLO was verboten in official policy circles. Andrew Young was forced to resign as Jimmy Carter’s ambassador to the U.N. in 1979 after the Israelis leaked the fact that he had met with a representative of the PLO. In 1977, Ted Koppel and Marvin Kalb wrote a thriller that turned on a US official having a supersecret meeting with a fictitious Palestinian group, and it leaking and the official being charged with betraying Israel. In 1976, the dissident Jewish peace group Breira came apart after Wolf Blitzer, who was at the time also working for the Israel lobby group AIPAC, reported in the Jerusalem Post that Breira members had met with PLO officials. Dean had a reputation for being free-thinking in Washington circles. In 1988, when Dean was ambassador to India, Pakistani President Muhammad Zia-ul-Haq died in Pakistan when his plane was sabotaged. Dean maintained that Israel was behind the assassination because it did not want Pakistan to obtain nuclear weapons, which it was then developing. Dean’s speculation was based in part on the fact that pro-Israel congressmen (Stephen Solarz and Tom Lantos) had visited him in New Delhi and pressed him to support Israel’s ally India over Pakistan and to seek to thwart Pakistan’s path toward nukes. Ronen Bergman’s new book on the Israeli assassination and terrorism campaign contains no reference to the John Gunther Dean attack. I asked him via a twitter message why he had left it out, noting that his revelation about Israeli security officials establishing the Front for the Liberation of Lebanon from Foreigners gives credence to Dean’s claim. He did not respond. The Israeli investigative reporter is now working for the New York Times, and lately reported in the Times on the killing of a Syrian rocket scientist in a car bomb attack in northwestern Syria on the night of August 4, evidently by Israel. P.S. The US government has had a miserable record of investigating known Israeli attacks on Americans– on the USS Liberty in 1967 and Rachel Corrie in 2003. Whats going on in Cairo: “Friday of Revolutionaries for Al-Quds, Al-Aqsa” ????? “Israeli” Channel 10 TV revealed that a secret meeting between “Israeli” War Minister Avigdor Lieberman and Qatar’s envoy to Palestine Mohamad Al-Ammadi took place in Cyprus regarding Gaza. نقلت وسائل إعلام إسرائيلية عن مسؤولين أميركيين أن رئيس الحكومة بنيامين نتنياهو اجتمع سرا قبل نحو شهرين مع الرئيس المصري عبد الفتاح السيسي في القاهرة لبحث المبادرة المصرية بشأن غزة ذلك أثار انتقاد أعضاء المجلس الوزاري المصغر الذين لم يكونوا مطلعين على اللقاء وما بحث فيه. وزير الأمن الإسرائيلي أفيغدور ليبرمان يقول إن مصلحة “إسرائيل” هي إسقاط حكم حماس، ويوجد خياران لتحقيق ذلك؛ “إما أن ندخل ونحتل القطاع من خلال التضحية بجنودنا، أو أن نصنع ربيعاً عربياً في القطاع”. تحدث وزير الأمن الإسرائيلي أفيغدور ليبرمان في حوار ضمن برنامج إذاعي إسرائيلي عن المفاوضات غير المباشرة التي تجري مع حركة حماس من أجل التوصل إلى هدوء جنوب فلسطين المحتلة، قائلاً”لا أعرف ما تعني التسوية وما هي هذه التعريفات، الواقع على الأرض هو المقرر وأداؤنا سيكون بما يتلاءم مع ذلك”. “للسلطة الفلسطينية مصالحها الخاصة، ومصلحتنا هي إسقاط حكم حماس. ويوجد خياران: إما أن ندخل ونحتل القطاع من خلال التضحية بجنودنا، أو أن نصنع ربيعاً عربياً في القطاع. وعلينا أن نتواصل طوال الوقت مع الجمهور وتجاوز قيادة حماس”. كما رفض ليبرمان إعادة العمال من غزة إلى العمل في “إسرائيل”، معتبراً أن إدخال 9 آلاف غزيّ إلى للعمل يشكل “خطراً أمنياً غير معقول”. يأتي كلام ليبرمان في وقت تجري مفاوضات بوساطة مصرية بين حماس و”إسرائيل” للتوصل إلى اتفاق تهدئة، يتضمن رفع الحصار عن القطاع، ووقف إطلاق النار.. Filed under: ABBAS, AngloZionist Empire, Deal of the Century, Great Return March, Hamas, Nazi Israel, Palestine, PLO, Ramallah Traitors, ROR, Uncategorized, USA | Tagged: Uncategorized |	Comments Off on Whats going on in Cairo: “Friday of Revolutionaries for Al-Quds, Al-Aqsa” ????? An army unit discovered a hideout for the so-called ‘White Helmets’ organization with mines and ammunition inside during combing operations in the newly-liberated towns and villages in Daraa northwestern countryside, in yet another proof of their involvement in carrying out terrorist acts in Syria. 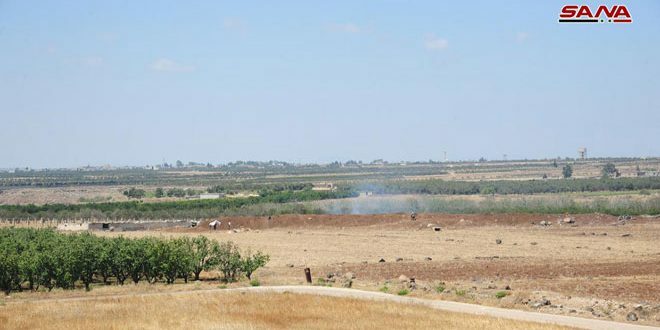 SANA’s reporter said that army units continue to sweep the villages of Hait, Jileen and Sahem al-Golan which have been liberated yesterday to secure them for the return of the displaced locals. The reporter said that the hideout of the ‘White Helmets’ was found in Sahem al-Golan town with anti-armor mines and artillery shells’ fillings of various kinds inside it. 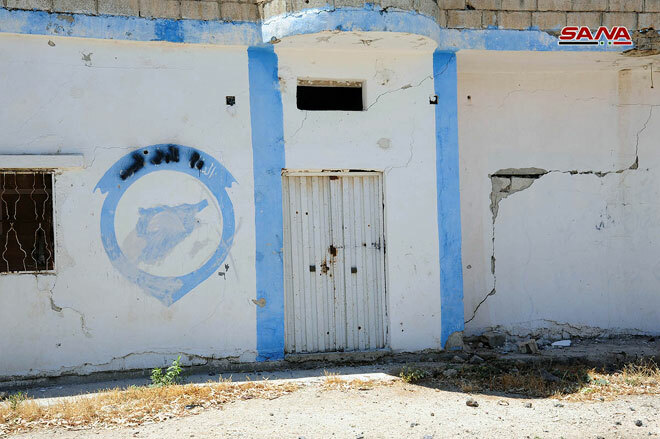 The reporter indicated that scores of displaced families have begun to return to their houses in Jileen town hours after liberating it from terrorists and the army’s sweeping operations in the town. On Thursday, army units operating in the southern region liberated the villages and towns of al-Sheikh Hussein, Kawkab, al-Shabrak, Mseirteh, al-Lweihek, Salbak, Tal al-Jomou’ and Sahem al-Golan following fierce battles with Daesh (ISIS) terrorists whose control over areas has shrunk to narrow spaces in al-Shajara town and several other smaller villages in Daraa northwestern countryside. After clearing the towns of Jilleen, Sahm al-Golan, and Haitt in the western countryside od Daraa provice of terrorism following violent clashes with Daesh (ISIS), army units continued on Friday their operations against Daesh terrorists in the towns of Nafi’a and al-Shajara, the latter being the biggest stronghold of the terror organization in al-Yarmouk basin area. A field commander told SANA’s correspondent that terrorists in Jilleen had been holed up in the Syrian-Libyan Cattle Company building in the town and set up a defensive line there, which the army managed to break on Thursday, and this was followed by entering the town from several directions and defeating terrorists within a few hours. The commander said that Daesh attempted to use car bombs and suicide bombers to hinder the army’s progress, but they were dealt with before they could reach their targets, and the terrorists’ defeat in the town led to a collapse in the ranks of terrorists in the nearby towns of Sahm al-Golan and Haitt. The correspondent, touring a number of towns and villages liberated by the army during the past few hours, said that Daesh had converted houses, state establishments, and mosques into bases and field hospitals, including one base for the so-called “White Helmets” in Sahm al-Golan. Syrian army units continue fighting in the northwestern countryside of Daraa and the southwestern countryside of Quneitra and retake control over tens of towns, villages, farms and hills, the last of which is al-Rafeed town, near the barbed-wire fence hundreds of meters to the east of Tel al-Faras. 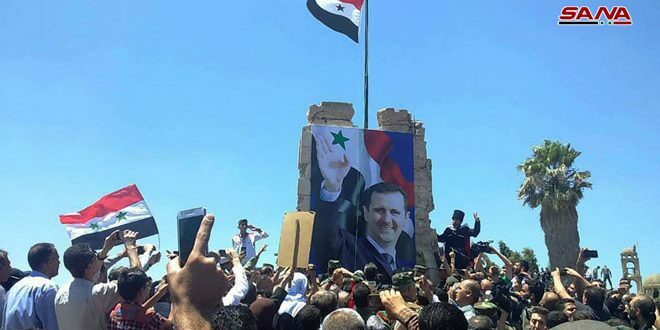 The town’s inhabitants, who stood steadfast against the Israeli authorities over the past years, are now welcoming the Syrian army units and celebrating victory over terrorist groups affiliated to Daesh (ISIS) organization. 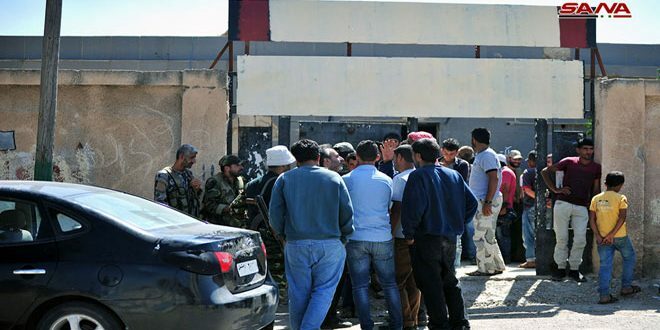 Normal life is gradually returning in the town as the Syrian army continues its achievements and liberate more areas such as Saida town towards al-Yarmouk Basin in the far southwestern countryside of Daraa. A secondary school student said that the town has received hundreds of displaced families who fled the heinous crimes and atrocities of Daesh terrorists in their villages. Competent authorities in al-Rafeed town started to settle the legal status of those who have gone AWOL in order to restore life and security. Some of people who have their legal status settled told SANA reporter that the armed terrorist groups attempted to put pressure on them and forced them to fight against their homeland. 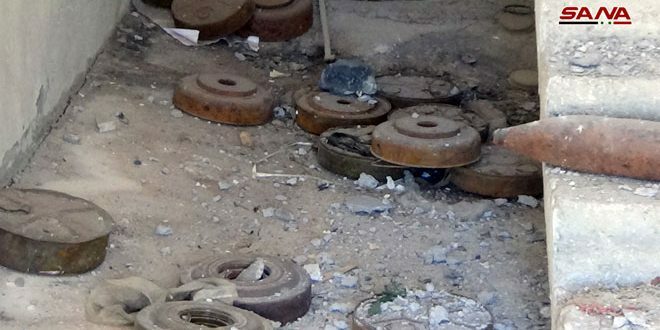 SANA reporter noted that the Syrian army units secured the city after they had eliminated the terrorist presence and dismantled landmines and explosive devices left by terrorist groups. The residents expressed their relief over the entry of army units to Quneitra city and the stability and security which prevailed in the city after the eradication of terrorism. They voiced support to the Syrian soldiers in their battle against terrorism till the liberation of the entire Syrian territory.